The purpose of this study was to investigate whether the ingestion of sodium bicarbonate (SB) pre-exercise improved athletic performance during resistance training (RT) and reduced fatigue in male college students. SB has the efficacy to neutralize the acidity of lactic acid that is produced during intense exercise by increasing intramuscular pH levels. Effectively neutralizing lactic acid from the consumption of SB 120 minutes prior to RT would enhance the performance of the subject in 1-repetition maximum (1RM) and muscular endurance tests. Male college students performed 1RM and endurance tests before their own individualized RT program 4 times a week during the 4 week study. 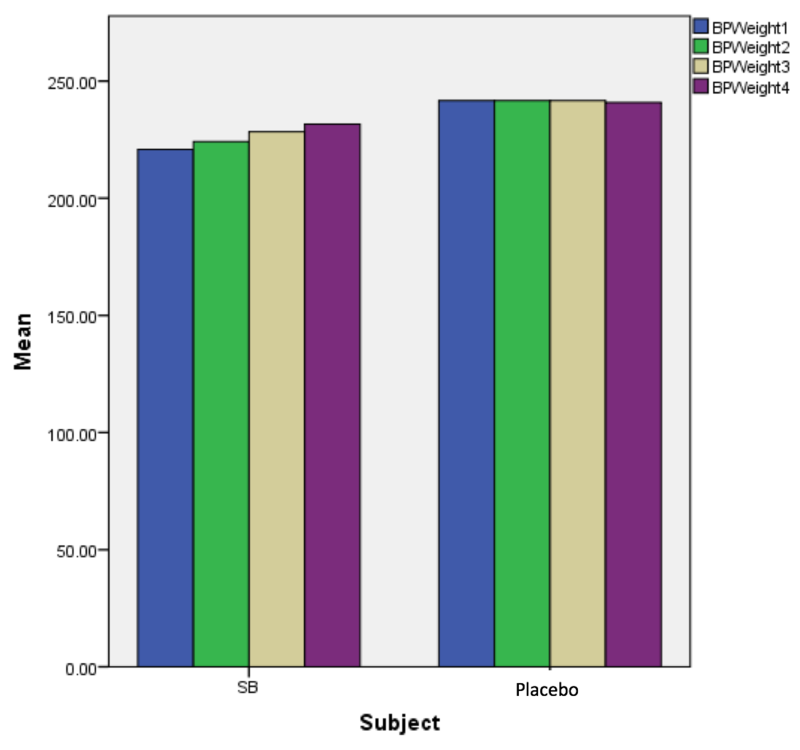 The SB group produced higher increases in mean weight used in each of the 1RM tests (P < 0.05) compared to the placebo group. The SB group also produced a higher amount of repetitions in the IDP, LP, and LPD endurance tests (P < 0.05). 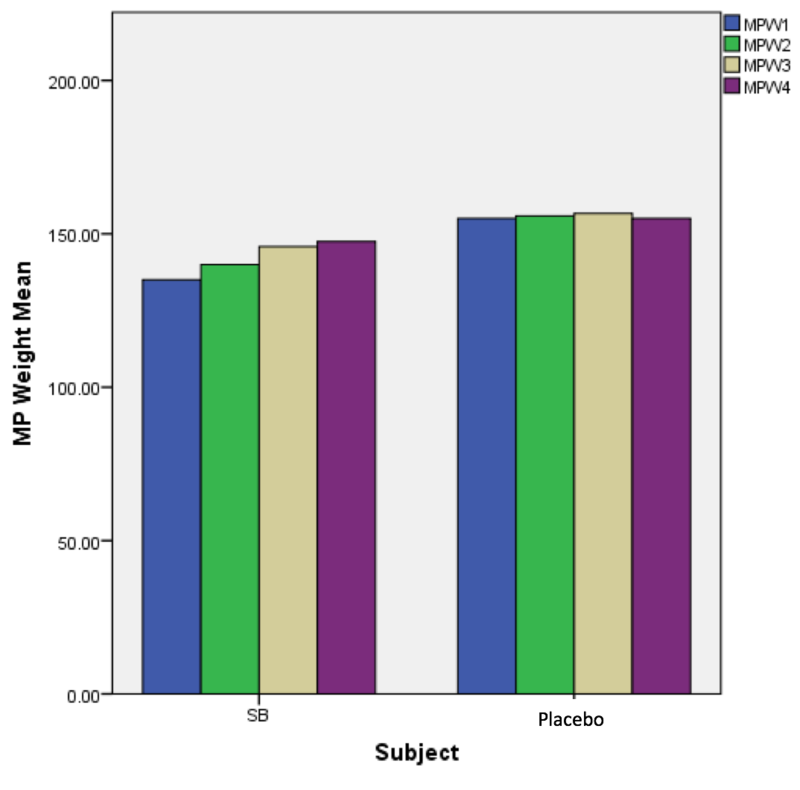 There was a significant difference in each self-report scale (P < 0.05) between the SB group and the placebo group. These findings suggest that the supplementation of SB prior to RT in college male students could enhance performance. A major cause of fatigue in high intensity, short-term activities such as resistance training, is the accumulation of H+ ions leading to intramuscular acidosis (1). This results in the production of large amounts of lactic acid and lowered pH in the sarcoplasm, which is believed to eventually hinder force and power development in the muscle fibers (10). The accumulation of hydrogen ions within a muscle can inhibit the metabolic and contractile processes of the muscle fibers resulting in a decreased work output and the onset of fatigue. In an effort to counter this state of lactic acidosis and to enhance the work output during high-intensity physical exercise, researchers have investigated the effects of increasing the body’s bicarbonate buffering system. Studies have tested the augmentation of the body’s buffering system by administering sodium bicarbonate (NaHCO3) to subjects prior to physical activity (6, 8, 9, 12, 15, and 17). However, previous research into the ergogenic potential of pre-exercise alkalosis has resulted in mixed findings (1, 6, 15, and 17). Differences between ingestion protocols and study design (for example: endurance vs. short-term, high-intensity training, sport specific training, number of repetitions, intensity, volume, etc.) have not provided a definite answer as to whether the supplementation of sodium bicarbonate (SB) enhances performance. Most studies have used intensities high enough to exert the glycolytic systems (minimum of 2-3 minutes) (1, 8, and 9). Other studies have also used large rest intervals in between training sessions which limit the researcher’s ability to test the rate of recovery due to supplementation (12). From a resistance training (RT) perspective, a more important aspect of pre-exercise alkalosis may be its influence on the athlete’s ability to overload their usual RT program with minimal recovery periods. To the researcher’s knowledge, no study has documented the subject’s RT performance and rate of recovery after testing the 1-repetition maximum (1RM) and endurance of four different muscle groups (8 exercises total) or used self-report measurements to examine the perceived effects of SB. 1RM tests and muscular endurance test administered according to the testing protocols stated by (2) are considered highly reliable (4, 11). Therefore, the purpose of this study was to compare the performance and rate of recovery of subjects induced of pre-exercise alkalosis with the supplementation of SB, to subjects who performed the same RT program and consumed a placebo supplement. After institutional review board approval, 12 male subjects (mean ± SD: age, height, weight and body mass index = 20 +/- 0.95, age range = 18-21 yrs, 1.78 +/- 0.067 m, 173.1 +/- 9.91 lbs, and 25.1 +/- 1.08) completed the study and each provided written informed consent prior to the start of the experiment. These subjects were not compensated for their involvement. All participants had been involved in a regular RT program for a minimum of 3 years, and were also engaged in at least 3 hours of resistance exercise per week. The participants were not diagnosed with any musculoskeletal pain or disorders. None of the subjects were participating in team sports at the collegiate level, bodybuilding or strength competitions, or intramural sports during the study. All participants were asked to refrain from taking any pre-workout or performance enhancing supplement that contains caffeine, creatine, or amino acids during the study. Subjects were also asked to maintain normal dietary patterns in the 24 hours before each training session. This study employed a placebo controlled design. Random assignment of intervention was done before the study began and after the subjects were assessed for eligibility based on the recruitment criteria. The 12 subjects were separated into two groups of 6 subjects. One group received the SB, and the second group was the placebo group which received the placebo supplement. Both groups performed the same exercises for each 1RM and endurance test throughout the study. Subjects were informed that they were participating in a study examining resistance exercise performance, and that as part of the experiment they would be asked to perform 1RM tests for BP, BS, MP, and BBR. They were also informed that they will need to perform muscular endurance tests for IDP, LDP, LR, and LP. Once each participant completed the 1RM and endurance tests, they were allowed to perform their own individual RT exercises. Subjects were guided through the 1RM and endurance tests by a certified personal trainer who instructed the subjects about proper weight lifting form and technique in order to minimize the risks associated with RT. The principal investigator was the personal trainer. He was certified in personal training by the American Fitness Institution in May of 2014. He is currently a student at the University of Tampa and is a personal trainer at the McNiff Fitness Center. The principal investigator was not compensated for training the subjects. All testing took place within the university’s fitness center. Each subject was present at the fitness center 4 times each week. The time that the testing took place was dependent on the subject’s availability due to the class schedules and extracurricular activities of the subject. The first training session involved an assessment of each subject’s 1RM for the BS, BP, BBR, and MP. Before administering the 1RM tests, proper lifting technique and form was demonstrated to each subject. The 1RM testing protocols were determined according to the methods supported by National Strength and Conditioning Association (2). The estimated loads for each endurance exercise (IDP, LR, LP, LDP) were determined from the methods advocated by National Strength and Conditioning Association (2). Body height (m), mass (lbs), and body mass index (BMI) were calculated before testing began (Table 1). Also, subjects were asked to fill out a brief pre-workout survey. Questions for the pre-workout survey included: “The time of the workout,” and “The time the supplement was taken.” After each training session subjects completed the post-workout self-report measurements which assessed: soreness (1-5 scale, 1 = extremely sore, 5 = no soreness), intensity of workout (1-5 scale, 1 = low intensity, 5 = high intensity), and improvements in strength (1 = high improvement, 5 = low improvement). Workout intensity was defined as the ability to perform each workout at the subject’s maximum potential. The subjects reported their soreness scale measurements the morning after each workout. Participants began each training session with a 6-minute submaximal interval cardio warm-up. This warm-up included a 1-minute walk at 4.0 mph, followed by a 1-minute jog at 6.5 mph. Before performing the 1RM exercise, participants completed 10 repetitions of the intended exercise using an un-weighted bar. Participants then completed the 1RM test. After the 1RM test, participants then completed the endurance exercise with a 3-minute rest interval between each test. Enhanced performance was determined by an observed increase in the weight used in the 1RM tests and an increase in the number of repetitions performed in the endurance tests over the duration of the study. The termination criterion for each test was the subject’s inability to complete another full repetition. Each training session was separated by at least 24 hours. The SB group consumed the SB (0.3 g NaHCO3 in 10 ounces of water) 120 minutes before each training session and the placebo group was given zero-calorie artificial sweetener that was mixed with 10 ounces of water. In order to examine differences in the self-report measurements for soreness, intensity, and strength improvement between the placebo and SB groups, an independent samples t-test was conducted. The results of the soreness t-test indicated that there was a significant difference in soreness between the two groups, t(10)= 6.98, p = .000 (Table 3). 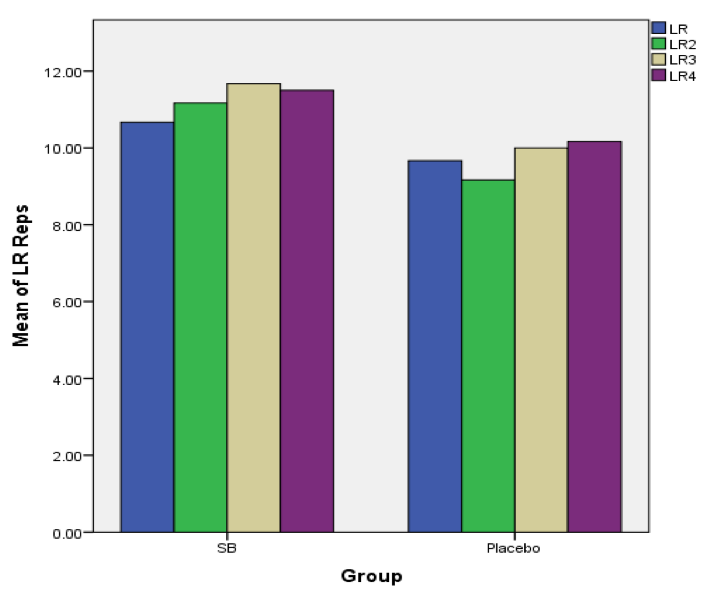 These results suggest that individuals in the SB group (M = 79.83; SD = 6.40) reported less soreness the morning after each workout than individuals in the placebo group (M = 52.00; SD = 7.38) (Table 2). The results of the intensity t-test indicated a significant different in perceived intensity between each group, t(10)=10.38, p = .000 (Table 5). These results suggest that individuals in the SB group (M = 86.67; SD 2.64) reported to have a much higher intensity level of training than subjects in the placebo group (M = 59.00; SD = 5.83) (Table 4). The results of the improvement t-test displayed a large mean difference in perceived improvements in strength between each group, t(10)=14.13, p = .000 (Table 7). 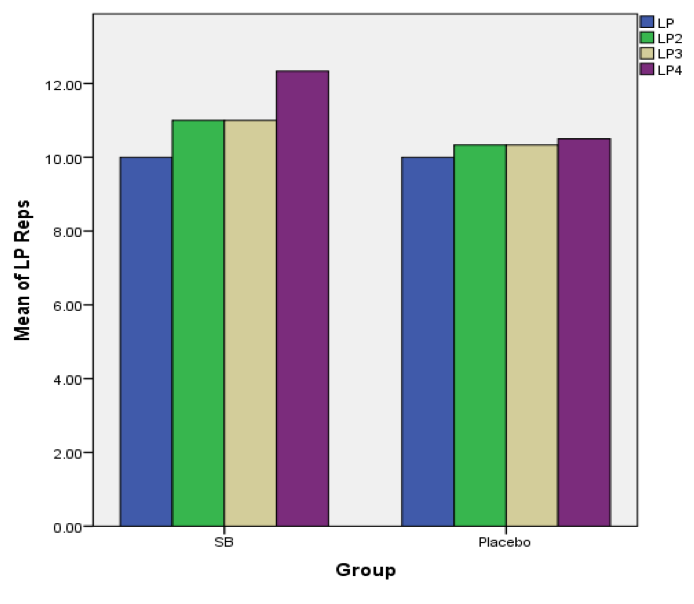 The data suggest that subjects in the SB group (M = 85.00; SD = 4.20) had larger improvements in strength than subjects in the placebo group (M = 47.67; SD = 4.93) (Table 6). 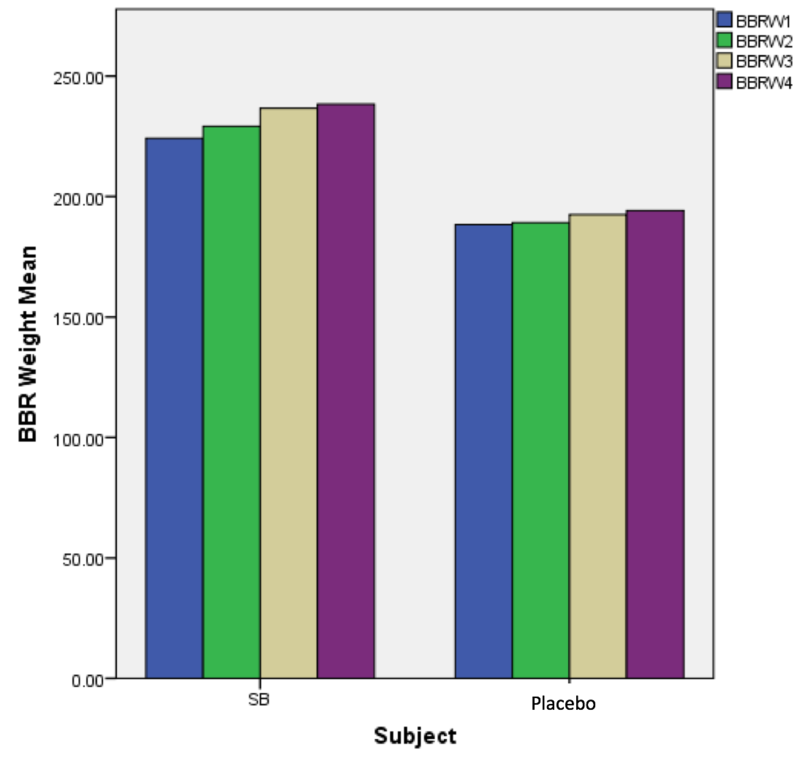 In the analysis of the BP 1RM test, there was a trend in the SB group that showed a slight increase in weight over the 4-week study (Figure 4). 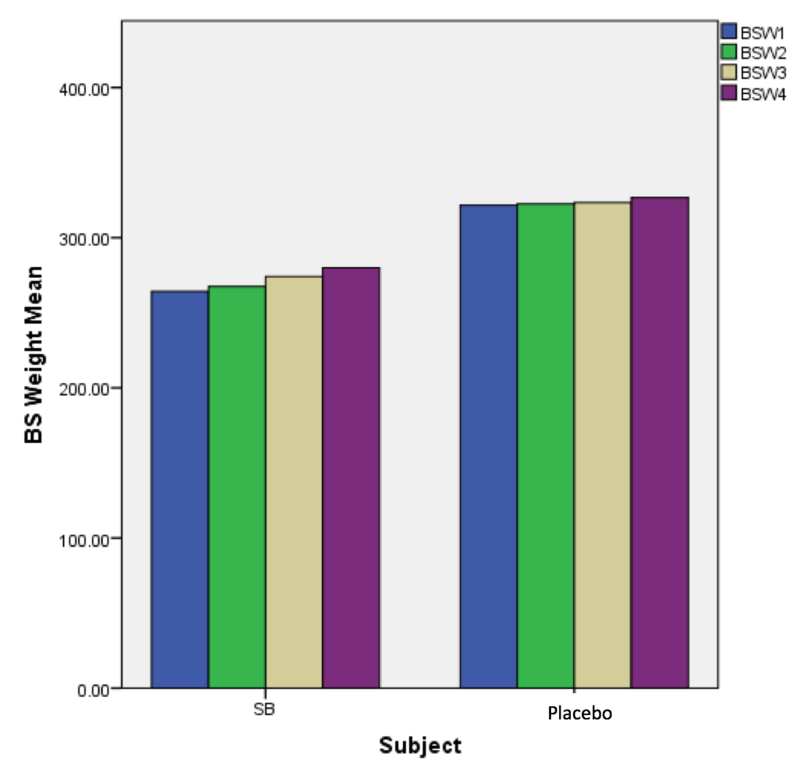 There was also a noticeable increase in weight in the SB group compared to the placebo group for the BS, BBR, and MP 1RM (Figure 1,2,3). 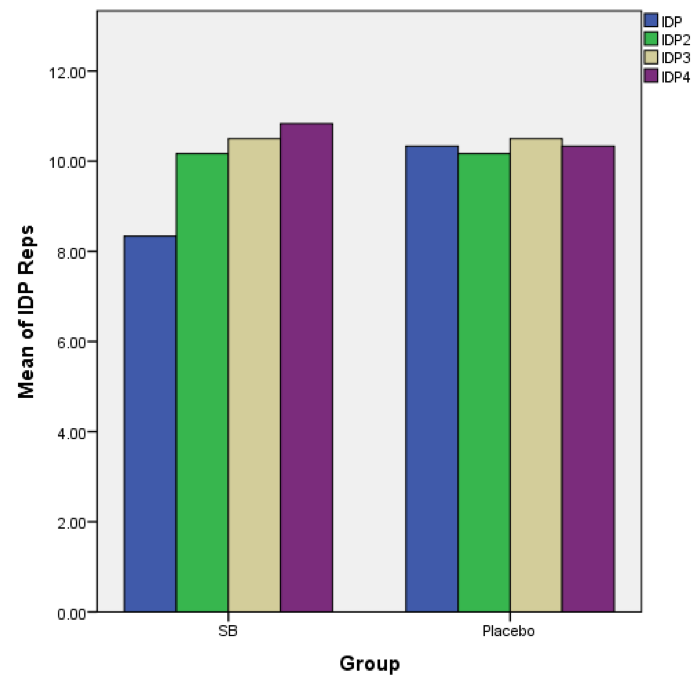 In the analysis of the IDP endurance test results (Figure 6), there was a two repetition increase in the mean repetitions performed in the SB group compared to the placebo group in the second training session. Over the next two training sessions there was a slight increase in the mean repetitions for the SB group. 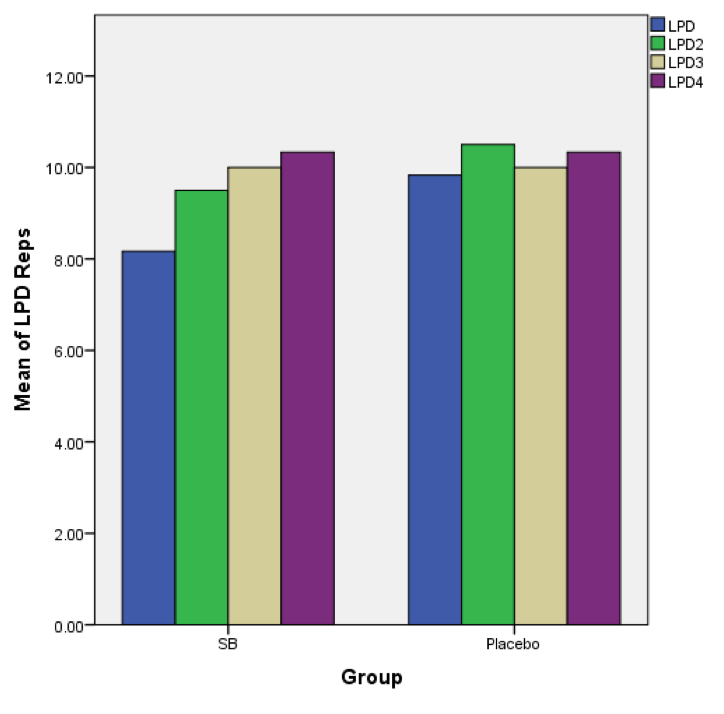 The mean repetitions for the placebo group remained consistent throughout the study for IDP. There was a positive trend in the analysis of the LPD endurance test (Figure 7). These results show a consistent increase in the SB group’s mean repetitions for each of the four training sessions. The mean repetitions for the placebo group in the LPD test oscillated throughout the study and there was no consistency. For the LP endurance test (Figure 7), the SB group showed a significant increase in repetitions between the third and fourth training session. In the LR endurance test both groups performed relatively the same and there were no significant differences (Figure 8). The results of this study suggest that sodium bicarbonate ingestion prior to RT can improve an individual’s 1RM (in BP, BBR, BS, MP), muscular endurance (in IDP, LDP, LP), and rate of recovery from RT. The data suggest that SB does not affect an individual’s performance in the LR exercise. It can be determined from Figures 1, 3, and 4, that the placebo group encountered a training plateau. In the analysis of the endurance tests, Figure 7 might have indicated that the placebo group encountered a training plateau. The data indicated that the SB group improved over the course of the study did not encounter a training plateau. However, the LR endurance test did not suggest that there was any improvement specifically for that exercise. The results from the self-report scales suggest that SB supplementation can enhance an individual’s self-efficacy during RT and may improve their strength. Mean ± SD data and t-test results separated by group are presented in Tables 2-7. The total volume of exercise, typically defined by the number of sets, is often manipulated to increase the acute fatigue stimulus and subsequent training adaptation. Some individuals exhibit a more rapid fatigue and neuromuscular response that plateaus within the first few sets (between 1 and 4) of a training session, which negates the requirement for additional sets of exercise (7). The exercise protocol in the current study did not manipulate any acute training variables (intensity, volume, exercise order and variation, density, rest interval) in order to induce a training plateau to the subjects. However, due to the efficacy of SB in enhancing RT performance, subjects in the SB group did not exhibit a training plateau when compared to the placebo group. Also, the exercise protocol implemented an interval aerobic warm-up. The purpose of an aerobic interval warm-up is to improve peak oxygen uptake and aerobic capacity (14). This is a unique feature of the current study’s RT program which differentiates the study from previous research (6, 8, 9, 12, 15, and 17). Athletes often utilize other nutritional substances or practices, referred to as ergogenics, in an attempt to obtain a competitive edge by enhancing energy utilization and delaying the onset of fatigue (18). Numerous nutritional ergogenics have been used in attempts to enhance endurance performance. Popular ergogenics that some athletes may use include beta-alanine, nitric oxide boosters (L-arginine), amino acids, caffeine, or creatine (18). Previous research regarding pre-workout supplements containing caffeine, creatine, and amino acids has shown increases in VO2max as well as augmented body composition and running performance (5). Therefore, subjects were asked to refrain from consuming any pre-workout supplement which contained those ingredients. Some supplements with nitric oxide as the main ingredient claim that a single use of the product will rapidly and dramatically increase circulating nitric oxide and result in an improvement in blood flow, muscle "pump", and exercise performance. Research which investigated the effects of the supplementation of nitric oxide prior to exercise has shown no favorable changes in RT (5). Beta-alanine has been shown to result in positive effects on exercise performance in which acidosis is a contributing factor to fatigue (8). Thus, subjects in this study were asked to abstain from beta-alanine supplements, but not nitric oxide supplements. Due to the problems with gastrointestinal distress in previous studies, subjects were asked to consume a lower dosage (0.3 g NaHCO3) of SB than prior research has administered to subjects (1, 17). The specific dose and timing of administering the supplement to the subjects was chosen based on previous studies (17). Also this amount of SB has been shown to enhance athletic performance while reducing any negative side effects (7). This study was limited by the fact that a larger dosage of SB could have led to a larger mean difference between the SB group and the placebo group. Limitations of the current study included the use of self-report measurements to assess the rate of recovery of the subject. Self-report instruments continue to be the most widely used type of physical activity measure (16). The recognized benefits of self-report measures are their ability to collect data from a large number of people at low cost. Social desirability bias can lead to over-reporting of physical activity (16). Recalling physical activity is a complex task and the format of the self-report scale can impact the findings (3). Most studies showed self-reports do not provide accurate estimates of the absolute amount of physical activity, so when absolute amounts of physical activity need to be estimated, objective measures should be used (14). The self-report scale used in the current study was a simple 1-5 scale to measure soreness, workout intensity, and strength improvement (1 = extremely sore, 5 = no soreness). This was an objective and unequivocal scale which was believed to have led to accurate results. This study was also limited by a small sample size (n = 12). It is possible that completing the study with more subjects could clarify the differences in the results and would provide a more clear understanding on whether SB does have some ergogenic benefit in RT. Certain confound variables that question the internal validity of the study included variables that affected each workout (diet, sleep, time of workout, etc.). An important difference between the current study and others which investigated the ergogenic benefit of SB is the exercise protocol that was implemented. This exercise protocol allowed subjects to perform their own workout regimen after completing both the 1RM and endurance tests. The purpose of allowing subjects to perform their original RT program was for the self-report data. Subjects would compare their self-reported soreness, intensity, and strength improvements to their initial perceptions of their performance before the study began. If there was a noticeable improvement from their original RT program, then it could be determined that SB does have the efficacy to enhance RT performance. The present study demonstrated that inducing an alkalosis state with SB causes an enhanced performance in strength and muscular endurance RT for male college students. Thus, coaches and practitioners could effectively use SB consumption to increase the physiological loading placed on the athlete in order to improve their performance for their intended sport-specific goal. Artioli, G. G., Gualano, B., Coelho, D. F., Benatti, F. B., Gailey, A. W., & Lancha, A. H. (2007). Does sodium-bicarbonate ingestion improve simulated judo performance? International Journal of Sport Nutrition and Exercise Metabolism, 17(2), 206–217. Baechle, Thomas R., and Roger W. Earle, eds. Essentials of Strength Training and Conditioning. 3rd ed. N.p. : National Strength and Conditioning Association, 2008. Baranowski, T. (1988). Validity and reliability of self-report of physical activity: An information processing perspective. Research Quarterly, 59, 314-327. M. Driller, A. W. (2012). The effects of NaHCO3 and NaCl loading on hematocrit and high-intensity cycling performance. Journal of Exercise Physiology (online), 15, 47–57. Maughan, R. (n.d.). Encyclopedia of Sports Medicine. In Nutrition in Sport (Vol. 7, p. IOC Medical Commission). Sallis, J. F., & Saelens, B. E. (2000). Assessment of physical activity by self-report: status, limitations, and future directions. Research Quarterly for Exercise and Sport, 71(2 Suppl), S1–14. Warnecke, R.B., Johnson, T.P., Chavez, N., Sudman, S., O'Rourke, D.P., Lacey, L., & Horm,J. (997). Improving question wording in surveys of culturally diverse populations. Annals of Epidemioiog», 7, 334-342. Webster, M., Webster, M., Crawford, R., & Gladden, B. (1993). Effect of sodium bicarbonate ingestion on exhaustive resistance exercise performance. American College of Sports Medicine, 0195-9131(93), 960–965. Williams, M. (1992). Ergogenic and ergolytic substances. Medical Science Sports Exercise, 9(24), 344–8. Figure 1. Group differences as identified by mean weight used in the Back Squat 1RM test in 4 subsequent training sessions. The figure demonstrates that there were increases in weight in the SB group compared to the Control group (P < 0.05). Figure 2. Group differences as identified by mean weight used in the Barbell Row 1RM test in 4 subsequent training sessions. The figure demonstrates that there were increases in weight in the SB group compared to the Control group (P < 0.05). Figure 3. Group differences as identified by mean weight used in the Military Press 1RM test in 4 subsequent training sessions. The figure demonstrates that there were increases in weight in the SB group compared to the Control group (P < 0.05). Figure 4. Group differences as identified by mean weight used in the Bench Press 1RM test in 4 subsequent training sessions. The figure demonstrates that there were increases in weight in the SB group compared to the Control group (P < 0.05). Figure 5. Group differences as identified by mean repetitions performed in the Incline Dumbbell Press endurance test in 4 subsequent training sessions. The figure demonstrates that there were significant increases in repetitions performed in the SB group compared to the Control group (P < 0.05). Figure 6. Group differences as identified by mean repetitions performed in the Lat Pull-down endurance test in 4 subsequent training sessions. The figure demonstrates that there were reasonable increases in repetitions performed in the SB group compared to the Control group (P < 0.05). Figure 7. Group differences as identified by mean repetitions performed in the Leg Press endurance test in 4 subsequent training sessions. The figure demonstrates that there were significant increases in repetitions performed in the SB group compared to the Control group (P < 0.05). Daniel Indorato is currently pursuing an MD at American University of Antigua in Antigua, Antigua And Barbuda.